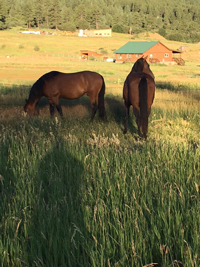 The weather finally got warm enough to bring my Fire horse temperament mare, Cerise, to Colorado. I left Texas on Saturday and hauled with friends to Ruidosa, NM where we spent 2 nights before heading the rest of the way to Pagosa Springs, Colorado. To prepare Cerise for the trip I started her on the Fire horse balancing formula to help her with her stress emotion of anxiety. I also brought hay from Colorado and mixed it with the hay she was eating in Texas. Cerise ate some alfalfa hay on the first leg of the trip. I like alfalfa for a Fire horse to buffer stomach acid and help prevent ulcers. She traveled very well and was happy to be with her horse friends in Ruidosa. She ate very well and I kept giving her the Fire formula to support her. The trip to Pagosa Springs was more rough. Almost the whole way was up and down mountains with curves. Plus, Cerise was not traveling with horse friends but all by herself. Cerise did not eat much on the trailer ride to Pagosa Springs and she seemed pretty tired when we arrived after the 8 hour drive. Cerise got to meet her new friend, Tanq, and he was great with her. I kept them separate overnight so Cerise could relax and eat her dinner and hay at her own pace. The next morning I put them out together and they both ran and played. Now they are close buddies. On the second day here I noticed that Cerise had a bit of a bloody nose and I assumed this was from a combination of the altitude and super low humidity. Since Cerise seemed to be doing well settling in, I changed her balancing formula from the Fire formula to Metal. The Metal balancing formula can be used for any type if they are having trouble with extreme dry weather. Cerise, who can be a picky eater, licked up the Metal formula and the next morning her nose was clean and showed no signs of bleeding. I also cut back her alfalfa as it can have a drying effect in the body. I have also been working each day on short horsemanship lessons with Linda Hoover. I believe these groundwork sessions have helped Cerise relax. The first lesson she was very stiff and braced in her body but the second lesson she moved very easily and had a very soft attitude. Bringing this softness to her body helped her adjust to her new home and environment. Overall, I am super pleased at how well Cerise has done with these long hauls and major life transitions. She has kept her appetite and her manure has stayed good. In the past, Cerise has gone off her feed and developed very loose manure when faced with a new situation. I really believe the balancing formulas have made all the difference. It feels just amazing to have her here with us and Tanq is happy to have a horse friend. Finding out your horse’s temperament type can really pay off in understanding what his nutritional, emotional and physical needs are. You’ll find lots of articles, ebooks, audios, the Horse Harmony book and the horse temperament website at www.horsetemperament.com to help you. Understanding your horse’s needs leads to a happier, healthier horse.